As January comes to a close, we are inviting you into the warm waters with a few one-of-a-kind artists. Go on a ride with AWOLNATION’s guitar driven alternative rock tunes, Poppy Ackroyd’s rich soundscapes and The James Hunter Six’s dynamic and soulful declaration of love. You will surely be the coolest music nerd in the house party this weekend once you tune into these albums, all out today! 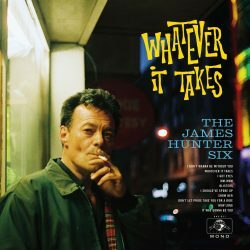 The acclaimed rhythm and soul singer James Hunter steals the hearts of his fans once again with his elegantly orchestrated and groovy third album Whatever it Takes via Daptone Records. Varying from rhumba to blues, Hunter revives the sound of the 60’s and invites you to the dance floor to keep you company with his soulful, gritty vocals and dynamic beats. Check out Whatever it Takes here and start dancing with “I Got Eyes” below! Here Come the Runts is finally here to take you on a refreshing trip to the dark corners of the woods. Feel the electro-rock of AWOLNATION like the breeze on your hand out of the car window, riding through curved mountain roads. Here Come the Runts, via Red Bull Records, marks the third album of the California based band, following their platinum-certified debut album Megalithic Symphony and second release Run which included hits like “Hollow Moon,” “I Am” and “Woman Woman.” Aaron Bruno’s exceptional producing, writing and recording skills meet progressive guitars and reverberating synths with furious and vulnerable vocals to form a dense and layered sound throughout the album. Listen to “Handyman” below, and you will see it is impossible not to stomp your feet to the rhythm of AWOLNATION’s sound. Check-out the full album here. UK based composer Poppy Ackroyd’s first full length album Resolve via One Little Indian Records, challenges how we perceive music by awakening emotions that may have been forgotten with the dust of everyday life. Being a classically trained composer, pianist and violinist, Poppy reflects her exploration of the neo-classical world (which we have also seen with her involvement in Hidden Orchestra) by utilizing her instruments in various unusual techniques and multi-layering sounds. The arrangements are elegantly planned resulting in soundscapes that feel as gentle as a flowering plant. Get a sneak peek with “Trains” below, and access the complete awesomeness here.